To become a lawyer, Whitnie McVay Henderson juggled full-time law school at night and a full-time job running an Oakland career program for inner city teenagers by day  all while raising her 8-year-old son. Then, after just one year at San Francisco Law School, Henderson lost her job to de-funding. But with the help of a $7,500 scholarship from the Foundation of the State Bar of California, the largest of several scholarships awarded to Henderson, she was able to continue her studies, raise her academic standing to second in her class and accept a judicial internship in Alameda. As in the past, attorneys can include a donation to the foundation this year when paying their State Bar fees. In addition, they can choose to contribute to the Conference of Delegates, which proposes changes in the law to improve the justice system. And they can join a State Bar special section for the educational and networking benefits. The bars fee statement packet  sent to more than 170,000 attorneys last month  highlights all three options as ways in which attorneys can voluntarily support their profession. The summary disbarment statute requiring an automatic loss of license for attorneys convicted of certain felonies involving moral turpitude seems likely to survive two challenges heard by the California Supreme Court. The justices appeared unmoved by arguments last month that the handful of lawyers who face such punishment each year should be allowed to explain their actions to the State Bar Court rather than be disbarred without a hearing. 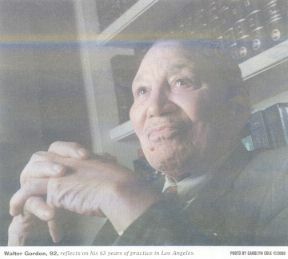 Looking back on 92-year-old Walter Gordons life, you might say that the course of his 63-year legal career was set by two attractive young ladies and a couple of bowls of chili. Slim, as he was known back in the late 1920s, was working in one of the chili and bean parlors popular in Los Angeles at the time when two young teachers vacationing from Ohio stopped by for a bite to eat.